A 362-hp 3.0L V 6 biturbo engine features numerous AMG® enhancements for instant response. Increased turbo boost puts its 384 lb-ft of torque on tap from 2,500 to 4,500 rpm, for a 0-60 time of just 4.7 seconds. Rapid-multispark ignition and high-pressure Direct Injection act with millisecond speed and molecular precision. Beneath its red engine cover, a lightweight diecast-alloy block, variable valve timing and reduced friction further raise efficiency and performance. The cylinder walls of the diecast aluminum block are created in an AMG®-patented process that benefits performance, efficiency and durability. NANOSLIDE(R) technology uses a twin-wire arc spray to coat the bores with an ultrahard layer that's honed to an ultralow-friction, mirror-like finish. Without the added weight of cylinder liners, the bores and lightweight forged pistons are matched with even greater dimensional precision, for more immediate and consistent power over a longer service life. AMG® has developed a version of 4MATIC®(R) that obliterates every notion concerning the performance potential of all-wheel drive. A 31:69 front/rear torque split assures an ideal balance of power delivery under hard acceleration and coming out of corners. In the Sport handling mode of the multistage ESP®(R), Torque Vectoring Brake further helps to prevent unwanted understeer. In every driving condition, AMG® Performance 4MATIC® enhances grip and acceleration while preserving agility and driving fun. The aggressively adventurous design of the AMG® GLC 43 draws the eye and inspires your driving spirit. 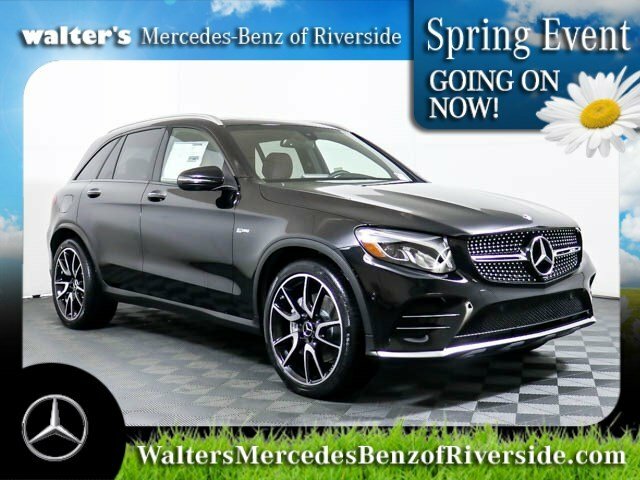 Its long wheelbase and short overhangs enhance handling, comfort and cabin room, while the distinctive grille, expressive headlamps, wide taillamps and coupelike side windows identify it immediately as a modern Mercedes-AMG® SUV. Low-profile roof rails feature a sleek anodized finish and are a reminder of the GLC's aerodynamic refinement. In form, feel, flow and function, the cabin of the GLC sets a class standard for style and craftsmanship, even among larger and pricier SUVs. The wide sweeping console features driver-focused controls, a cascade of rich wood and a sensousness that continues throughout the cabin. 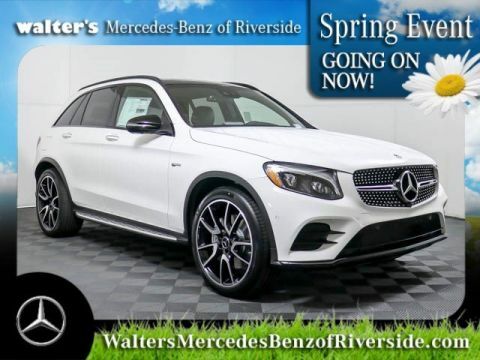 Modern color and trim options, elegant aluminum switches and trim details and intuitive technologies create an environment that puts every element of driving enjoyment in harmony with you. Strategic use of high-strength steel, extruded and cast aluminum, advanced polymers and innovative acoustics have created a spacious yet lightweight body structure that elevates safety, quiet comfort and handling precision, even as efficiency is increased. A wide track width, long wheelbase and large door openings further enhance the driver's and passengers' enjoyment of the GLC's bold shape. Exclusively sculpted sport front seats feature deep bolsters hand-fitted in Black MB-Tex with DINAMICA microsuede inserts. Red topstitching and seat belts add to the racing-derived look and feel. A variety of upholstery and seating options are also available. The thick, flat-bottom sport steering wheel offers a rewarding grip and a clear view of the exclusive instruments. Brushed-metal pedals with rubber studs and red-trimmed AMG® floor mats underscore it all. Radar-based technology alerts you if you're approaching a vehicle ahead, or even some stationary objects, at a speed and distance that suggest a collision is likely. As soon as the driver starts to brake, the system can automatically provide an appropriate level of braking to help prevent a collision or reduce its severity. If you fail to respond, the system can also initiate braking automatically from speeds up to 65 mph and can activate the features of PRESAFE®(R). The first system of its kind, ATTENTION ASSIST®(R) continuously monitors up to 70 parameters of driving behavior and can automatically alert the driver with both visual and audible warnings if it detects signs of drowsiness on long trips. With enhanced sensitivity, the system can also help detect drivers who begin their trip drowsy and offer more useful information to drivers along their journey via a new dashboard display. Interpreting information that is continually supplied by the vehicle's Electronic Stability Program (ESP®(R)), electric power steering and suspension sensors, Crosswind Assist helps detect the effects of strong side winds on handling stability at highway speeds. Whether caused by lateral gusts or even a passing truck, the system helps keep the car on course via strategic braking of the wheels on one side of the vehicle. 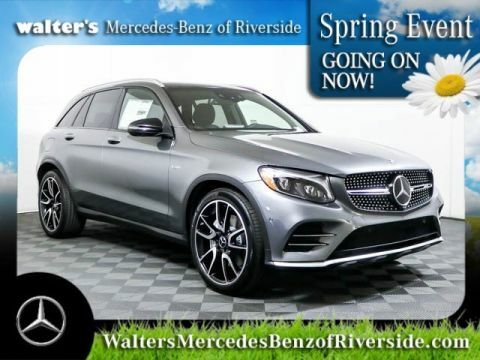 Meet your new 2019 Mercedes-Benz AMG® GLC 43 4MATIC® in person today at Walter's Mercedes-Benz of Riverside located at 3213 Adams St. Riverside, CA 92504.